Rangitoto Island is an unmistakable landmark in the Hauraki Gulf near Auckland, New Zealand. Its distinctive volcanic cone shape can be seen from many places throughout the city. The volcano is about 600 years old, making it the youngest of all the volcanoes around Auckland. Visiting Rangitoto makes a wonderful day trip out of Auckland, with plenty to do and see and a fantastic scenic ferry journey to take you there and back. Rangitoto Island is a major worldwide success story when it comes to restoring the ecosystem. Once awash with invasive species, serious eradication and control programs were undertaken to remove every single non-native animal from Rangitoto. New Zealand is known as a world leader when it comes to controlling pest species, and Rangitoto is a jewel in the crown. Thanks to the work of scientists and government, Rangitoto Island is now a safe haven for native NZ wildlife and plants which are making a wonderful comeback and provide one of the biggest reasons that people love to travel to Rangitoto! A fascinating and historical part of Rangitoto Island that many people are not aware of are the Bach Settlements, which are an important part of the social history of the island. 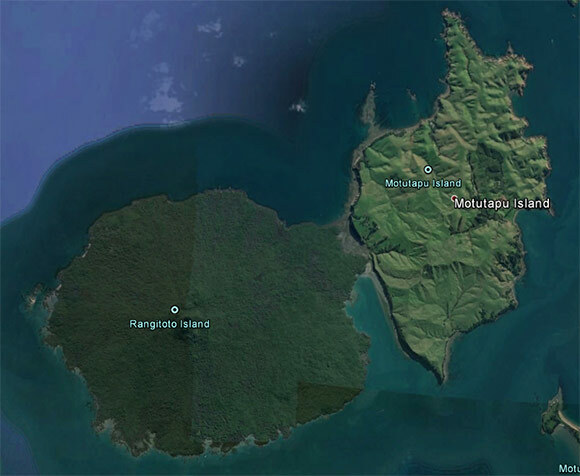 There is a startling difference between the almost totally cleared Motutapu Island, and its neighbour, the lush completely forested Rangitoto Island. How to get a ferry from Auckland to Rangitoto and return; prices, timetable and ticket information. Most people travel to Rangitoto from Auckland. From the main ferry terminal in Auckland at 99 Quay St, there are several services per day that go to the island which are run by the Fullers company. A ferry is a great way to have a day out at Rangitito, with enough time to walk to the top of the volcano and back to the return ferry in the afternoon. It takes about 25 minutes to travel from downtown Auckland across to Rangitito wharf on the ferry, and needless to say the ferry trip itself is also a wonderful sightseeing experience! Currently, Fuller’s runs three daily services between Auckland and Rangitoto Island during the week, with a fourth service operating on weekends. Note: The 12:45PM and 3:30/4:00PM ferry services also stop at Devonport. There is an early bird 7:30AM sailing from Auckland on Saturday and Sunday only, with discounted tickets. Adults sail for $20, and children for $10 at this time only. Where to buy ferry tickets? There are two options: purchase your tickets online if you like to plan your trip in advance, or you can buy them at the Auckland ferry ticket office before you set sail. The name "Rangitoto" means "bloody sky" in Maori. Rangitoto is the only volcanic eruption in the Auckland Volcanic Field that was seen by humans. This remarkable eruption witnessed by Maori people around 600 years ago is described as being "extremely violent" by geologists and would have produced massive amounts of lava, so it is little wonder it would have appeared as if the skies were "bleeding" during this event. Rangitoto Island is officially a pest-free island. Although in the past it was home to many non-native animals over long periods of time, control programs have removed them all and the island has been free of any non-native animals since August 2011! The island has since started to thrive as a native bird haven. 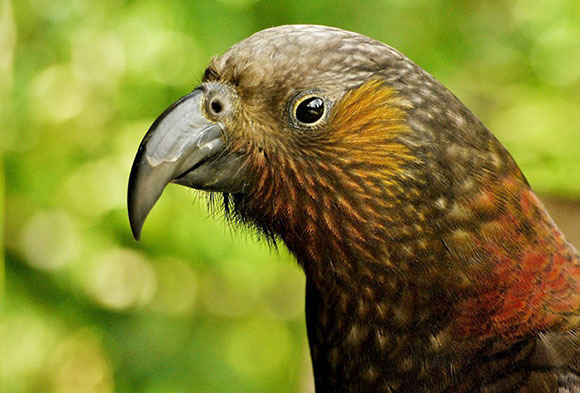 Species such as the Kakariki, Kaka, Saddleback, Bellbird, Tui, fantail, grey warbler, silvereye and NZ's only native owl, the Morepork or Boobook owl can be found on the island. Rangitoto Island is a haven for native New Zealand birds and plants. This pest-free island is a safe haven for many of the country's unique species which are a highlight on any visit! Also known as the Korimako, the Bellbird is not always seen, but its melodious bell chiming calls are a real pleasure to hear when you're walking in the forests on Rangitoto. Amazingly, the Bellbirds on Rangitoto have their own unique "voice", audible to keen birdwatchers, as do other populations of this species in other locations throughout New Zealand. The Bellbird also found on Motutapu Island which it was absent from for over 100 years! It was only in 2010 that it was rediscovered there.